I had a special reason to decorate my front porch for winter this year! It’s because my sweet friend Nancy gave me a tin snowman that I’ve been wanting for Christmas and I knew just what I wanted to do with it! 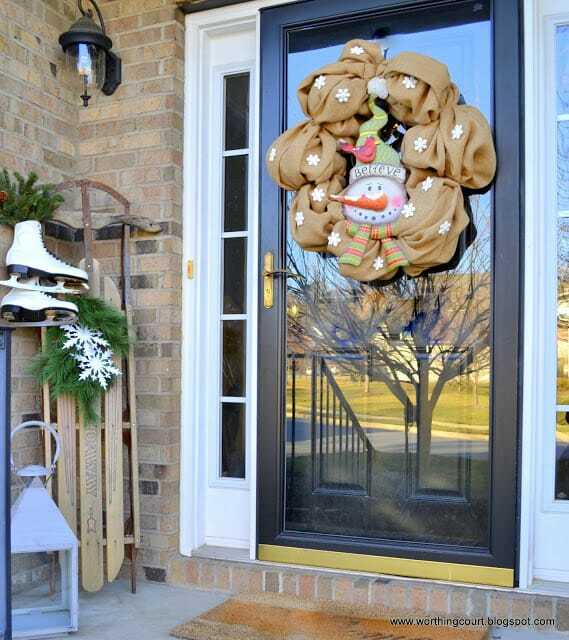 I put together a simple burlap wreath, wired Mr. Snowman on and added some Dollar Tree snowflakes to make a winter themed wreath for my front door. I found a couple of other things that I’ve been longing for too – a vintage sled and some vintage ice skates. We all know that Craigslist is a great place to sell things, but did you know that you can also post there when you’re looking for something specific? That’s what I did when I was on the hunt for a vintage sled. 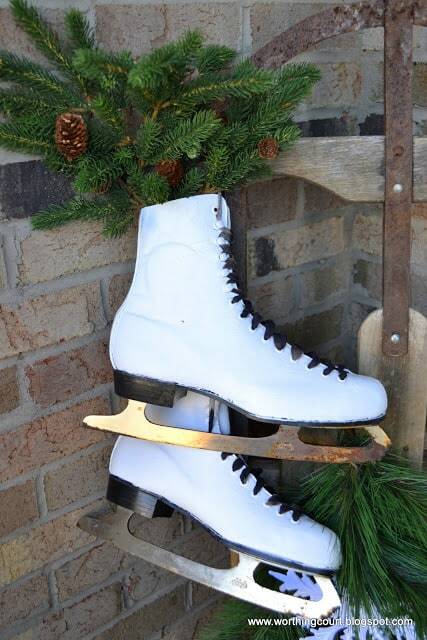 Want white ice skates and can’t find them? That was me. No worries – I found some black ones at a flea market so I just painted them with white chalkpaint. If you do this, make sure to completely wipe down the surface of the skates with mineral spirits before painting. It gets rid of any oily residue that may be on them. So there you have it – my very first ever Winter Front Porch. Oh – I’ll admit that I felt a little silly putting this porch together during the unseasonably warm weather we were having, but thankfully it wasn’t just wishful thinking! Looking for some indoor winter inspiration? 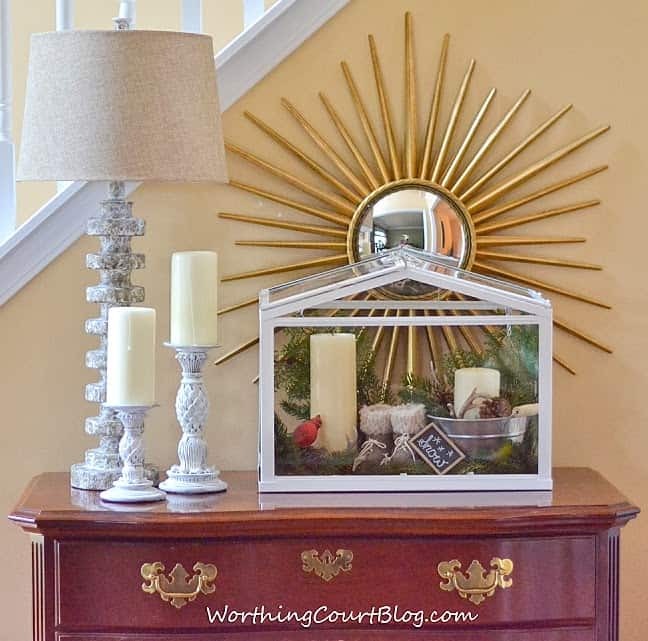 Check out the Winter Vignette that I put together in my foyer. Oh Suzy! Your porch is perfect! Burlap, metal, old wood, chalkpaint, and dollar tree! All the things that I love. You got it done just in time. We didn’t get any snow. Maybe next time. Looks Great! I love the burlap wreath. What is your base for the wreath? The base for the wreath is just a plain wire wreath form that you can pick up at any craft store. I think that I only paid about $3 for mine. Looks so pretty Suzi…wow, you did get lots of snow….I think we got about an inch and it was pretty much gone by mid-day….love the wreath … great gift from Nancy…I was wondering what you were doing with your skates…great Craiglist find…I had no idea you can put out a call for an item!! How cute and perfect timing. Love you front porch and how great that you ordered the snow, just in time. I have been away from the computer, again. Lots of changes going on here. I will email you. Oh, BTW have you ever ice skated? I understand it is easy if you have good ankles. I meant to tell you that was a clever idea to paint what you can find. When you said the sled appeared on your porch, did they give it to you or was that “tongue in cheek”? Love the porch, that wreath is fantastic. Truly adorable — and relatively simple. I’m pretty sure that even I could do this!!!! (Trust me, that’s saying a lot about the ease. The wreath is adorable, yet LOOKS to be relatively simply. It’s sooo original. You are incredibly creative. I just don’t know how you find the time with all you do with the girls. Someday, on a separate note, maybe you can outline a typical week – how you balance house cleaning (you keep a perfect home in spite of its large size); shopping, crafting, day care, cooking, laundry, etc. I have always struggled with time management. You could teach a class on this! 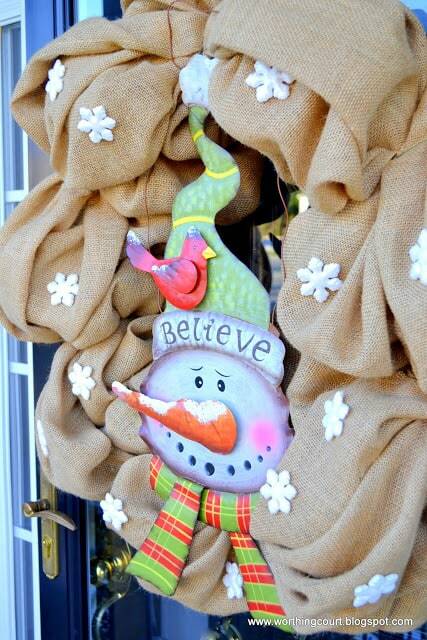 Love,love,love the wreath, your gifted snowman was just perfect for this! How smart you are painting the skates. Thanks for sharing. I’m blaming you for the snow! Love your porch though. And I was wondering where you found those white skates. Now I know. Very clever, friend. Love, love, love your winter porch. It is so cute and cozy. That is the cutest wreath I’ve seen in a long time. I love it! Your porch is wonderful! Would you consider showing how you made your adorable wreath? me – it was super easy! If you’d like more info, please shoot me an email so that I can reply directly back to you. 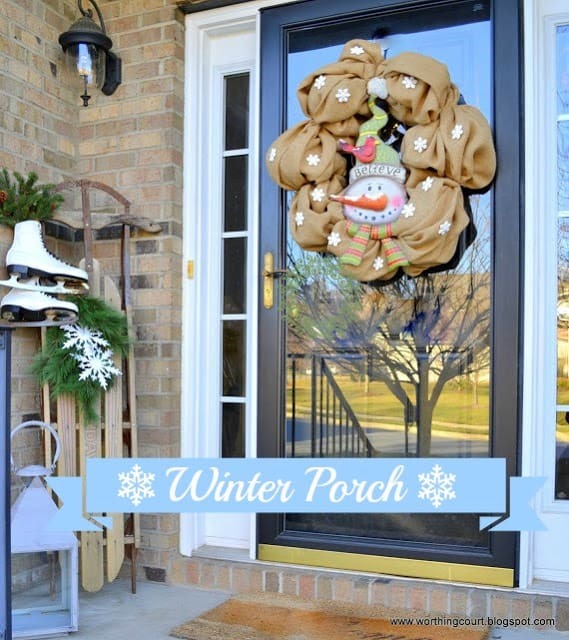 Love your Winter Porch!! 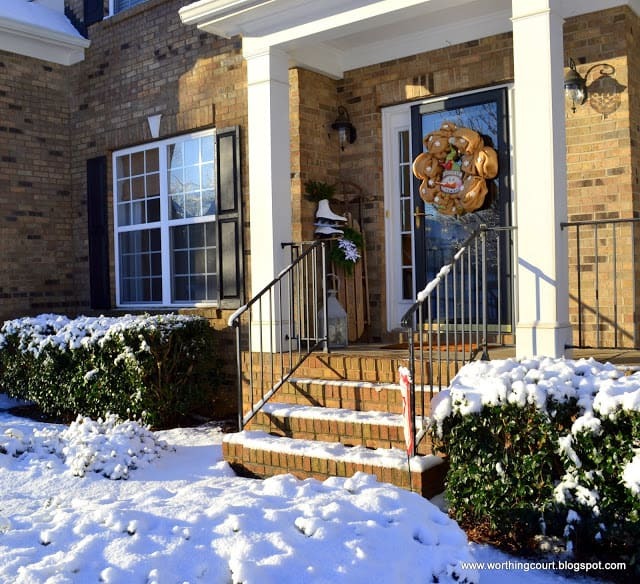 I decorate the outside of my home for Winter too…. 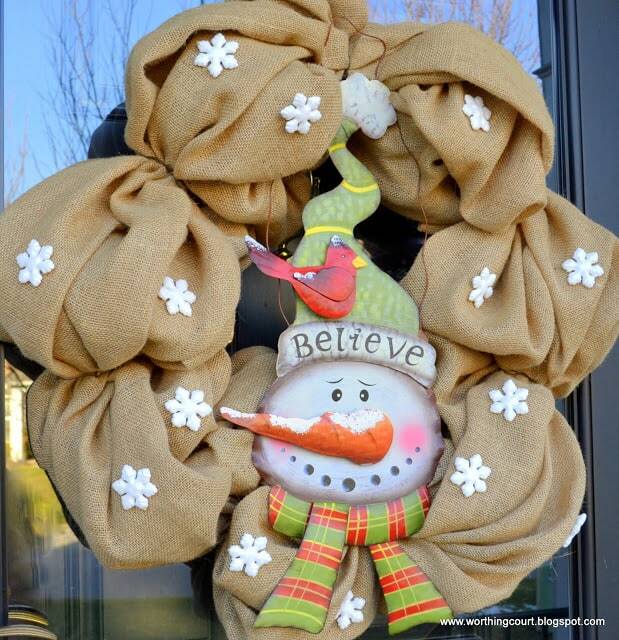 I absolutely adore your pretty snowman wreath! So cute! 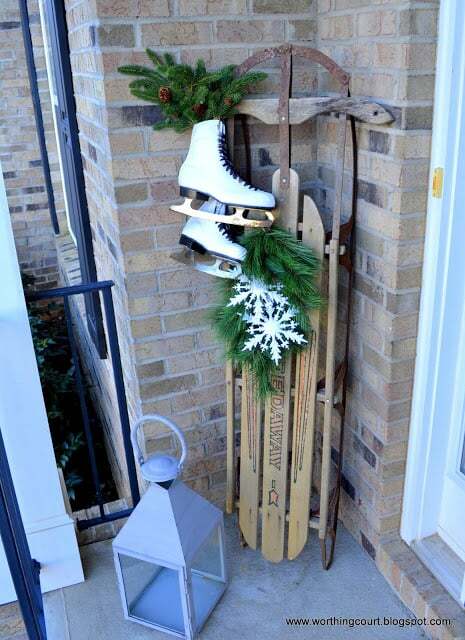 And the vintage sled and skates are the perfect additions to your winter porch! That is so adorable, Suzy! Did you order that snow for special effects? LOL! I love it, especially the wreath. I just looks so warm and welcoming! I love your winter decor, Suzy! It’s so inviting. I miss having a big front porch to decorate. I really love your wreath…will you show us how you did it…? 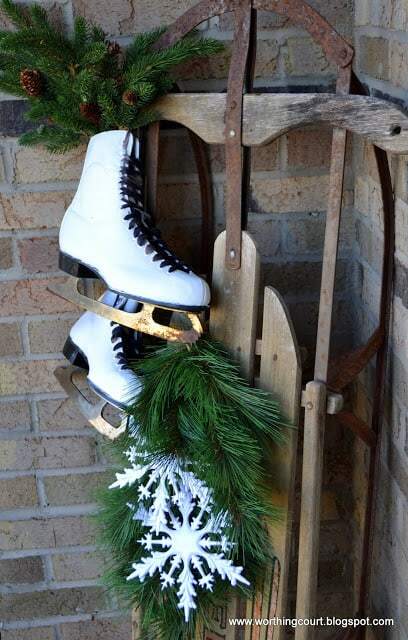 I have the skates…would love a vintage sled, too. Such a fun post. Nobody ever knows what to do with their front doors this time of year. It all looks fun but I am especially drawn to the sled and skates. Looks like you have had quite a bit of snow this year. We have nothing here in Iowa and they are talking drought again. I sure hope not. Thanks for participating. I’m always glad to have you here. Oh my goodness, what a happy, winter welcome you’ve created!